Getting your message in the hands of your customers is one of the most effective weapons in your marketing arsenal. The real power behind direct mail communication is having an accurate database. As a company whose mailing department plays a big role in its business, Mitchell Graphics knows how much work it takes to build and maintain a mailing database. It takes significant resources—time and money—to gather names and addresses and keep them up to date. Then take into account the forty million ‘Change of Address’ (COA) forms filed annually, and there’s simply too much information for businesses to keep track of manually. The United States Postal Service (USPS) enters all COA updates weekly into a database, known as NCOALink (National Change of Address), where they are retained for 4 years. These include individual moves, family moves and business moves. When utilizing bulk direct mail (for postage discounts) to contact your database, the USPS requires you use a move update method to minimize the extra cost required to process undeliverable as addressed pieces. The move update options are Ancillary Service Endorsements or NCOALink processing. You could also designate ‘or Current Resident’ in the mailing address, but this only guarantees delivery to the physical address and not the intended recipient. For targeted mailings, NCOALink processing provides the best value. 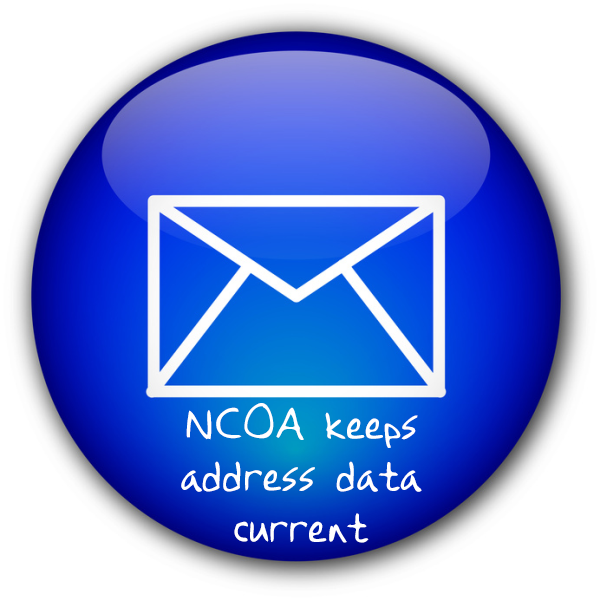 With this option, the USPS matches names and addresses on your mailing list to filed COA forms in the NCOALink database. When the name and address on your mailing list matches the name and address in the database, the updated address replaces the old information. Postal customers who move multiple times within a four-year period are linked to ensure the latest address is supplied when an NCOALink match is gathered. After processing is complete, a list of the updated addresses is available to you, relieving some of the headache that goes with making sure your internal database is kept up to date. It’s important to note, however, that the NCOALink database is only as accurate as the information provided by individuals and businesses filing the COA forms. Not only must the forms be filed in exactly the same manner as previous to ensure proper chaining, but the spelling must be exact as well. Sometimes the Katy Peters in the database is Katherine Peters in your outdated mailing list. Katherine Peters will not be linked to Katy’s new address. NCOALink processing may not be able to guarantee a 100% fool-proof updated mail list, but the COA matches that are made will save wasted postage and avoid returned or recycled undeliverable mail. QUICK FACT: Did you know… in order to have ‘undeliverable as addressed’ mail returned, you must mail at First Class rates? Standard and Non-Profit mail without an additional ancillary service endorsement does not include return service, and undeliverable pieces will be recycled by the post office.